I felt like doing something a little different for a Father's Day craft this year. Each year I see lots of cards and gifts that are sports or handyman related but not all fathers fit into these categories. My memories of my father are not attending baseball games or playing catch but of music. I have memories of dancing to my dad singing Rocky Raccoon and playing the guitar. I can recall 2 hour driving trips to the beach singing songs by Tom Petty, The Rolling Stones, and U2. My father is an artist not an athlete. So if you too have a Rockin' dad in your life, here's the craft for you, a matchbox guitar. Matchboxes - Here's a template I made if you don't have any matchboxes. It also works well since it's blank. You can draw whatever you want on it. 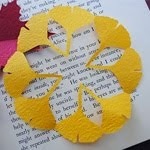 As with all my craft projects, they're meant to be created in your version. Feel free to substitute any of the supplies you want. Don't be afraid to change things up! 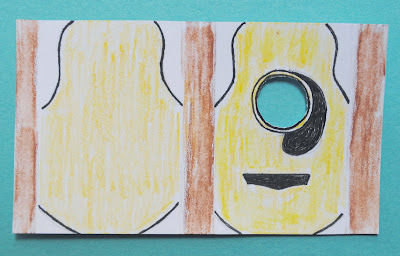 Have an adult cut a hole with an X-acto knife on the matchbox template. Decorate matchbox anyway you wish. 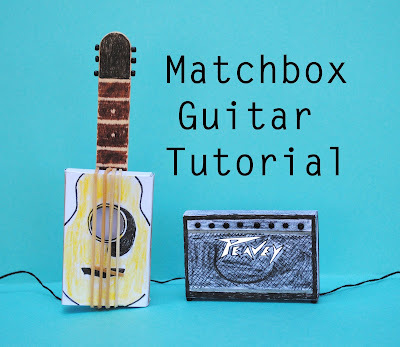 If you have a pre-constructed matchbox, you may want to paint it instead. 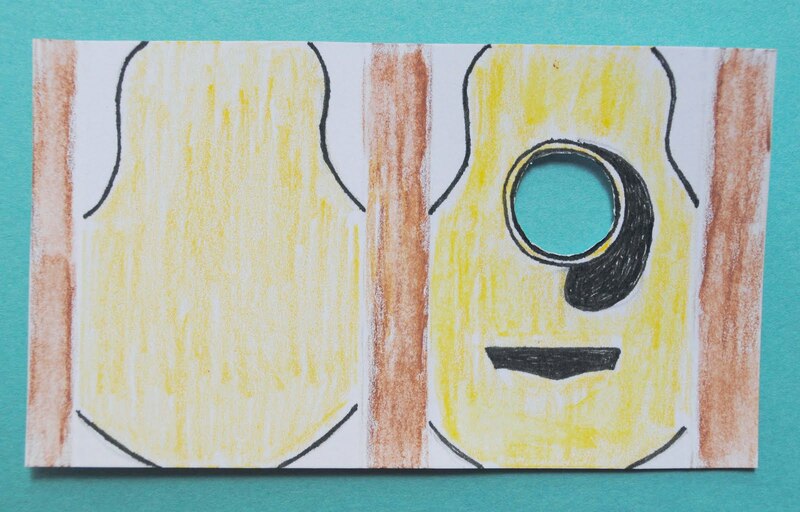 *Before decorating the box, have the child look at some pictures of guitars to get a feel for what they want they're guitar to look like. Fold and glue up match box. Wrap four rubber bands around the box (refer to picture). Cut a small piece of rubber band and place it underneath the four rubber bands (refer to picture). 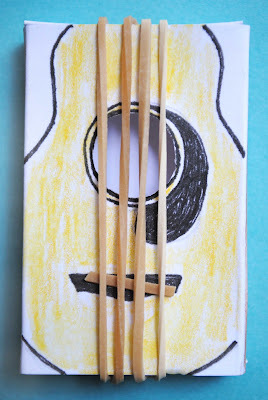 Decorate popsicle stick to look like the guitar neck. Glue three black seed beads on each side of popsicle stick. Let dry. I used plain white glue and they stayed on fine. 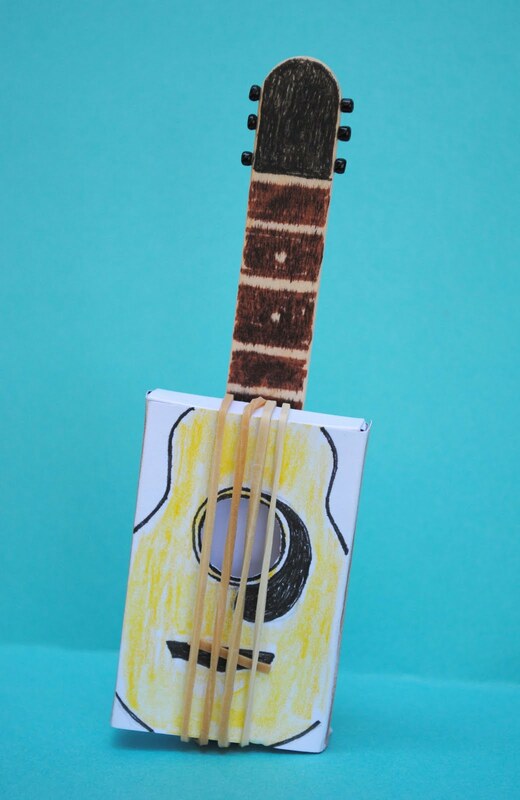 Hot glue popsicle stick on the back of the guitar on top of rubber bands. Done. 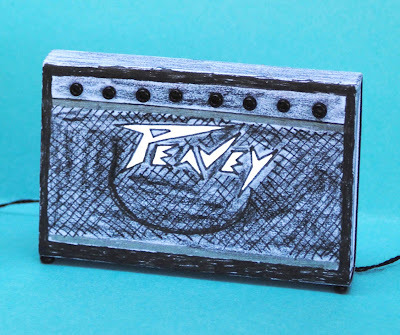 After I made the guitar I decided it needed a prop for the photos so I made a matchbox amplifier as well. All I did was color the matchbox to look like a speaker. Then I glued on some black seed beads for the knobs. I also glued some beads on the bottom of the amp for legs (also helps it stand up). I'm thinking this might make a cute guitar pick holder. What do you think? 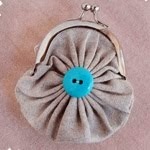 It's soo nifty! What imagination! For some reason, for a second, it brought to mind those old crafts books that we used to have in the school library (British) that were remnants of the 60's and 70's - I think because looking at such things brings such inspiration in terms of how it is possible to transform simple materials into something of substance/signification. I also had a chuckle reading that previous post where you explained your husband's response to some of your crafting, I am pretty sure we all have similar experiences. Given the fantastic jamming equipment picture in the post, it's only correct to end this comment with the congratulatory exclamation: rock on! no one play guitar in our family but maybe they should! Thanks for the inspiration! This is adorable. The tongue depresser is perfect. My husband is a guitarist, so he would love this. I had to read the materials list twice, I saw Black Seed Beads and thought it read Black Eyed Peas! 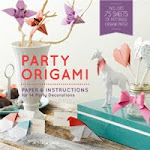 PS Your Glue craft party looks like so much fun. Love the photo of Grandma. This is SO cool. I am so very impressed with what you just did! Oh that's clever. Must remember to do this for my guitar playing hubby. Just need to get a matchbox now.